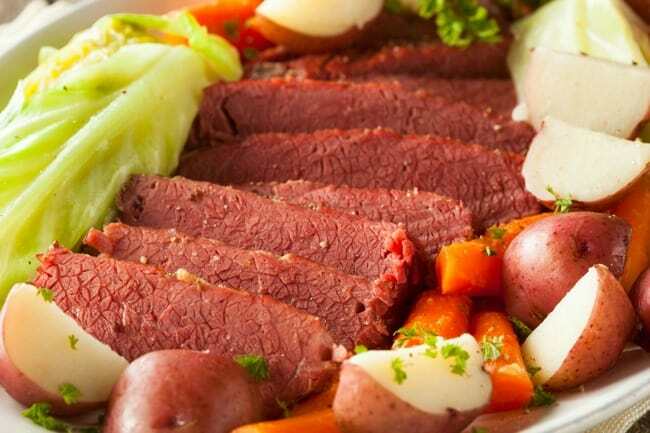 St. Patrick’s Day is just around the corner so I’ve got 3 slow cooker corned beef recipes for you to consider celebrating it with. 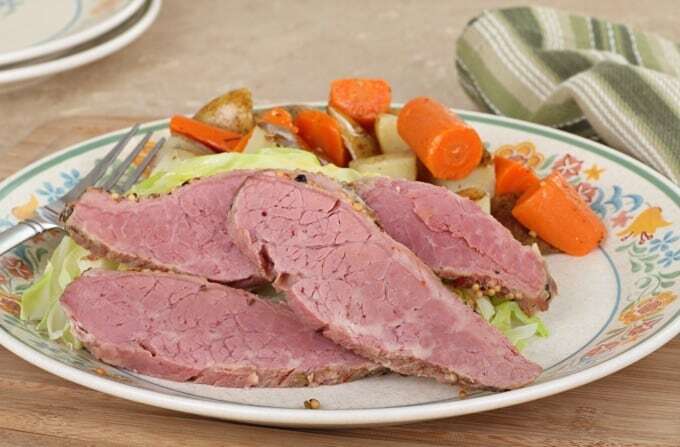 For many of us, it wouldn’t be St. Patrick’s Day without indulging in a plate of corned beef and cabbage. It certainly wouldn’t for me. It was a hot topic at my Weight Watchers meeting this week (along with green beer). While I’m not the least bit interested in green beer… Give me a Guinness thank you very much. It’s a whole lot more filling with fewer calories. Did you know that Guinness Draught has about 125 calories, while the same about of Budweiser has 145 and skim milk, 129? But I digress! Mom always makes her corned beef and cabbage on the stove top, so for many years I carried on the tradition. But since I’m always looking for ways to make things quicker, easier and simpler, for the past few years I’ve been experimenting with different slow cooker corned beef and cabbage recipes instead. For the first recipe, I opted for a “light” recipe, making just a few minor adjustments. The original recipe called for only 1 cup of water, so the meat braises instead of boils (think steam room instead of hot tub), leaving it moist and tender, not wet and slimy or dried out. The next time, I braised the corned beef in beer for an extra flavor boost. 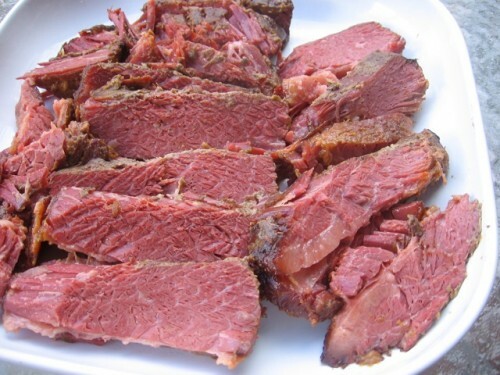 And most recently I slathered a mustard-maple glaze on the corned beef and skipped the liquid altogether. I loved them all and would be hard pressed to chose a favorite! So, I’ve listed them all here for you. Making slow cooker corned beef is incredibly easy and amazingly delicious, so it will be my go-to way of preparing if from now on. For the total Irish experience this St. Patrick’s Day, why not bake up a loaf of Irish Soda Bread, Easy Whole Wheat Soda Bread, or Irish Brown Bread to serve alongside? 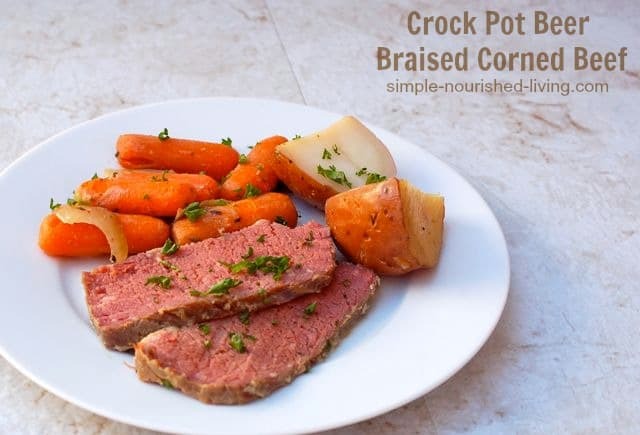 According to my calculations, each serving of this Crock Pot Corned Beef has 340 calories, *9 Weight Watchers PointsPlus, *11 WW Freestyle SmartPoints. Enjoy! 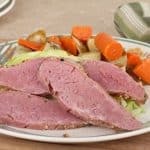 If you’ve made this Slow Cooked Corned Beef, please give the recipe a star rating below and leave a comment letting me know how you liked it. And stay in touch on Pinterest, Facebook, Instagram and Twitter for the latest updates. Place the carrots, onion, potatoes and cabbage in the slow cooker. Pour water over the vegetables. Sprinkle the spices from the seasoning packet evenly over the meat and then place the meat on top of the vegetables. Remove the corned beef from the slow cooker and let rest on a cutting board for 15 minutes. Thinly slice the meat across the grain. Place on a platter. Using a slotted spoon, scoop the vegetables out of the slow cooker and place them on the platter alongside or around the meat. Serve with mustard or horseradish, if desired. Large chunks of peeled parsnips and/or turnips would also be delicious. I have to be honest, I had low expectations for this recipe, but I wanted the lowest calorie corned beef to get my St. Patty’s Day fix. I was stunned how awesome it was. Totally flavorful and amazing. I did a 3.77 lb roast and did it as 8 servings instead of 12 for 266 cals a serving. Amazing. I’ll make it again before next year! So glad this exceeded your expectations, Kristin! I always love when that happens!! My sister and I never made corn beef and cabbage before. We followed the recipe with maple syrup and mustard rub and it is soooo delicious and tender. Thank you! I’m just learning to appreciate my slow cooker. This recipe was easy to follow and was delicious. I made this for St. Patrick’s Day 2019. My husband looked in the crockpot and wasn’t too impressed until he took a bite. He asked me to make it again soon. We love cabbage so I’m happy to accommodate him. I was going to use the leftovers to make soup but there weren’t any! I appreciate the recipe.